February is all about taking those good habits that we set in place in January, and locking them solidly in place so that we can keep the course all through the year and for the years to come. I think that to do that, some of us have to take a different point of view on those new habits. Instead of of looking at them as limitations that we impose on ourselves to achieve our goals, why don't we look at them as enhancements we are bringing to our every day life? I'm not limiting junk food, I'm enjoying more healthy foods. I'm not forcing myself to not snack in the evening, I'm just finding healthier ways to wind down. Recently Jennifer Hudson was asked "How do you stay motivated to track everyday?" She answered "Really?!? I get to look like this- and all I have to do is to track?" I had never thought of it quite that way, had you? We keep talking about how important it is to track, how it keeps us on track, but still we act like it's a chore, something painful that we have to do if we want results. What if we starting thinking about it differently? What if tracking was a gift we're giving ourselves? What if we could make it work, make it effortless, make it fun? Lets see if we can find ways to do that together! Well, since I wasn't around last week, I have no idea what happened! As I have been down with the flu for over a week, not much as been going on other than a lot of online time, couch time, and whining. HA! I did manage to win a giveaway online which brought me to a realization about what direction I want my lifestyle to take. You are never really done building up your life and deciding which direction it is to take at any given moment. Here's my thought process about this whole Vegan/not vegan thing. I did try a new food! Mung beans!I made a soup and it was absolutely delicious! Look it up here : Whole Mung Beans Soup. After the Farmers Market Sunday before last, I swung by Jai Ho a little Indian grocery store (awesome by the way) for spices, and grabbed those little green beans/lentils thinking I should give them a try. I did and I LOVE THEM! Give them a try! The warm up is done, we have identified the steps we need to take, and learned how to take them. Now it's time to fine tune them and find our second wind. We're in this for the long haul, and we're in this together! We will not let the momentum slow down, we can make this work because we Believe! I'll be back in the meeting room this week, I can't wait to see how you are all doing. In the meantime, never be afraid of emailing me. I'm there for you! Change is a funny thing. You'd think that it's a very simple process, that you make the decision to change and that's all there is to it. If only... Changing one's life is a process, it is complex it happens in stages. To try and do everything at once is putting a lot of pressure on ourselves, often it's setting ourselves up for failure. When it comes to changing our habits for successful long-lasting weight loss, it's easier to proceed by stage. We are changing from the Outside In. First we control what's around us. Distancing ourselves from temptation and surrounding ourselves with "safe foods". As we get better at this, little by little we move toward the center of the circle until our very identity has evolved into "I am a healthy, active, thin person." It's only January though, a lot of us are just getting started, or restarted. Why don't we start by the beginning? Or is it begin by the start? This week lets deal with that outside circle, the environment. How can we manage our environment for a successful, enjoyable and durable weight management? It's been a crazy and awesome week out in the meeting rooms! When I say that you guys are a bunch of losers, I mean it in the proudest and most loving way! San Bruno on Tuesday night had 50 people weighing in. 50! I am so happy that I had Adelina and Samina there to take care of everybody! It got a little crazy, but we are inviting an extra receptionist next week to make sure we don't get overwhelmed. Those 50 people at Bayhill lost 54.8 lbs! 1.1 lb/member! You guys rock!! Stonestown was also a little crazy with 54 members. We had already staffed up though, and this week the computers cooperated (thankfully!) so it went pretty smoothly I believe. Now the weight loss at Stonestown is just crazy. The 54 members who weighed in lost 72 lbs. That's 1.3 lbs/member. Stonestown wins this week! I am incredibly happy and proud to see everybody lose so much weight! I'm also happy that it seems like the winning meeting switches back and forth. The game is on my friend!! I repeat myself I know, but again thank you for your patience. Bigger groups make for longer lines, but also for very animated meetings and the merging of more ideas tricks and suggestion than we see in the smaller group. I have also seen many "already members" extend a helping hand, take the time to explain things and share their wisdom with the people who are walking in our doors for the first time. Thank you, you are reminding me of why I am truly doing this.I don't always have the time to thank you on the spot, but you are noticed and greatly appreciated! I've been cooking up a storm lately. I made a delicious fish soup Friday night ( January 6th) that I had to share It was a Tilapia-Kale Soup. I've also been bragging about my Goulash Hongrois all week! It was delicious, easy, and I got to freeze quite a bit of it for future use. Finally, I made a Butternut Squash-tomato Soup that was very much made up as I went but turned out to be absolutely delicious! I cooked many other things, but those were too common place to bother blogging about it. We are putting down the bases on which we will build success all through 2012 and for the years that follows. I'm impressed by the cheer energy and push forward I get every time I step in the meeting room. We are on baby, and we will achieve our goals! Lets keep the momentum going. In the meeting room, talk to your neighbors, check in and make sure that that person who was sitting next to you last week is there, and reach out. Check in with your friends and make sure they keep coming with you, or that they start coming if they aren't already. What's better than a partner in success? (well I can't say a partner in crime here right?). I am here if you need me, just drop me an email! Thank you for being there for each others and for me. It is a great feeling to be part of such a wonderful and powerful group of people. Yay us! See you in the meeting room! You've been running all day. It's 5:30pm (or later) and you're running in the house, drop your stuff and look wishfully at the couch when someone pops a head around the corner and ask: "What's for dinner?" You run everything you know is in the fridge and the pantry in your mind and realize that anything you come up with will be at least an hour of preparation and cooking (not including thawing out the meat!). There is just no way, you're tired, hungry, it's just not happening. "How about we call in pizza?" We all have that happen every once in a while right? How often does it happen though? Ever look back and realize "Woah! I've "called in" dinner 3 times this week!" That's a lot of extra calories, and dollars! Putting dinner on the table doesn't have to take very long, or be very complicated. All it take is a little thinking ahead, a little organization and the right tools*! You can have a home made meal on the table everyday without having to spend hours in the kitchen. 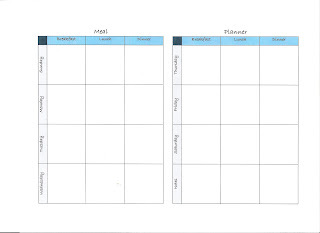 This week we're talking about how powerful planning can make your meals easier and healthier! We could tell the January fever has hit the meeting rooms already! We are seeing more people, and happily a lot of people came back after a little holiday hiatus. Welcome back everybody! I want to thank everybody for their patience. More people means longer lines, and we are doing everything we can to keep things moving. It's all so exciting though! Stonestown had 48 people weighing in and lost 24.8 lbs which is 0.51 lb/member. How close is THAT? Last week San Bruno was behind, but they more than made up for it this week. I must add that being the first weigh in of January, with a lot of people coming back after taking a little break, both weight loss are impressive! You rock!! I lost my award sheet *blush* and do not want to go by memory for fear of forgetting someone. So all of those who passed milestones this week CONGRATULATIONS! 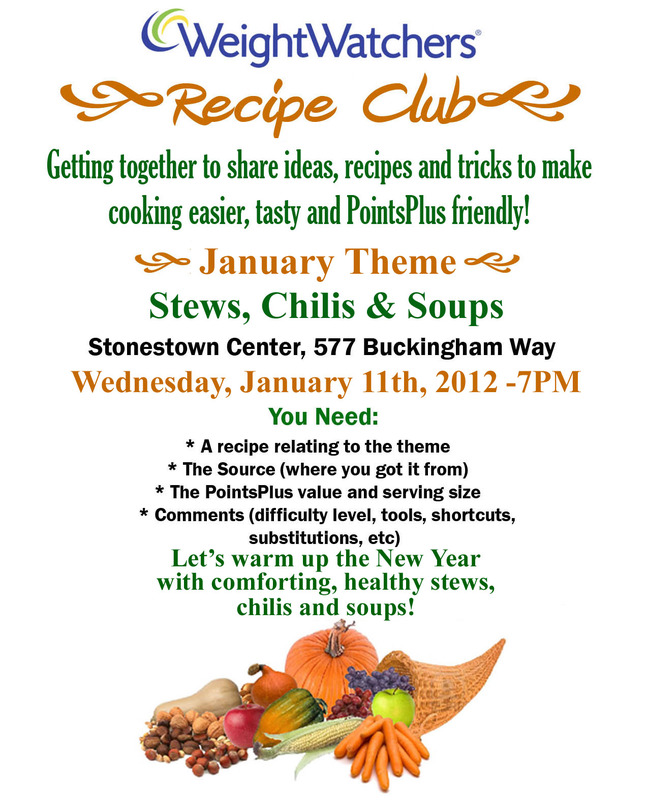 There is a meeting of the Recipe Club this week at the Stonestown Center Wednesday at 7pm (after the 6pm meeting). It's a fun way to get together and talk about cooking, new recipes ideas and tips and tricks to make meal prep more fun and less of a chore! All you need is 1 recipe relating to the theme. It doesn't have to be a complicated recipe! Actually, we've turned out to be a very practical-minded group. The simpler the better! We love to cook, but we don't want to live in our kitchen! Bring your friends, all are welcome! Wednesday I wanted to cook some bulgur, but I had no broth whatsoever. I hate to cook grains in water, it doesn't taste like anything. I didn't have time to go to the store and all that, so I decided to improvise. I must say that it turned out quite well. See what I did here in my No Broth No Problem post on my Recipe Blog. Thursday I was hungry and couldn't decide what to make for lunch so I decided to improvise! Look it up in my Clean the Fridge post. It's nothing complicated really, more of an example of how you can make things work if you keep it simple! Friday I was greatly inspired after leaving my first meeting in a while. I stopped by Whole Food Market and got shrimps, Kale and decided to spoil myself a little: Shrimps with Kale. This week has been on of many lessons for me. After realizing that I was putting much more in the process than in what I was trying to achieve, I started putting things in perspective. A little accidental miche of bread started the whole thing. If I ate the whole thing (minus a slice that I gave my husband), is it lame? Or can it become a victory? It's all in how you look at it, see my post: Lame or victorious? Finally, as I mentioned I went to a meeting as a member. It had been a long while, for many reasons I did not feel that I could go to a meeting and feel like a member. It's difficult to put the "Leader aside" and just focus on "me". I found a leader whom I felt completely at ease with and a ground in which I had made many friends, so I finally showed up thinking "Just go in, if it doesn't turn out well, then... at least you tried." I received a warm welcome from everybody I knew in there. It was like walking home! I walked out of the meeting feeling inspired, motivated and full of ideas! It's like this thing works! See about it here: All in a meeting. I have been a leader for over 8 years now. Lets just say it is not my first January at Weight Watchers. This one is starting with a special energy. We have a good thing going, everybody is ready, motivated and it's contagious! We are settings serious, realistic (if ambitious) goals, and we know deep in our heart that we can totally achieve them. Lets keep the current going! I will see you in the meeting room this week! Until then email me if you need anything. Have a great week! "My goal for 2012 is to get this weight loss thing back on track and finally make it to goal! No resolution, no promises to be perfect every day of the year, I have set a realistic goal, and I will make it happen! Sounds good but I'm not sure I actually can make it happen. It's not like it's the first time I try, I'm not sure what I can do for it to work this time. What if I can't have my wine? My chocolate? I don't want to eat carrots and lettuce all year. I'm not sure I can give up all the foods I love, all my social engagements. I've done this weight loss thing before, maybe I've been at it already for a while and well... I'm not exactly melting if you get my drift. Why make all those effort to hardly lose anything?" Does this sound familiar? Do you find yourself sometimes setting a goal, determined to make it happen but not altogether confident about actually achieving it? You are not alone! This week we will use the knowledge of the PointsPlus 2012 program, along with the lessons of our past weight loss experiences all wrapped up in good old common sense to dispel our fears and realize that YES each and every one of us can achieve our goals. This week was a tough week for weight loss. It was the week of Christmas, Yule (the solstice), and Hanukkah! Still we have lost! Those of us who have kept going through the holidays are now ahead of the game for January! Tuesday at the San Bruno Bayhill center for the 6pm meeting, 17 members weighed in. We managed to lose 4.4 lbs! That's 0.26, or about 1/4 lb per person! Good job! We had no award, but Nancy, who couldn't make it to the meeting, left me a note to say that she DID add a walk on the weekend like she had promised to do on the 20th! Go Nancy! Wednesday at the Stonestown Center, also a 6pm meeting, 23 members weighed in and we lost 8.6 lbs! That's about 0.37lbs/member or a little over 1/3 of a lb! Elissa and Jen both passed the 20 lbs milestone, and they both, along with Ruth, earned their Stay and Succeed award for being there for 16 weeks. Look at your weight record, and plot your way to your next milestone. What will it be? Another 5 lbs? A percentage? When he made one of his milestone, 5% I think, Rich, a member at Stonestown explained that he felt he had to stick to this, and go the extra mile so that he wouldn't let the team down. That's what we are, a team, and everybody is an important player! Most of my cooking during the holidays has been quick and uninspired. We spent our energy on relaxing, going outside and watching cartoons. Don't judge us, we are nerds and proud of it! I did make an experiment in mid-December that turned out quite well! I had this recipe for banana bread that I spent some time fine tuning, and when my friend gave me a bag full of pineapple Guava, I decided to experiment! See the result of my experiment here: Pineapple Guava Bread. I baked this all by myself! Two of them actually, for real! 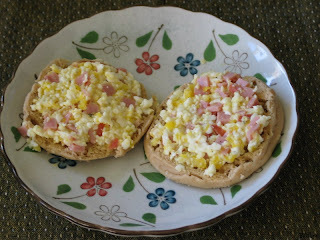 This next breakfast recipe is an old one that I just trotted back out this week. In my family, we call it "Mushed-up egg half sandwiches" the name evolved from my bad English and our enjoyment of silly sounding names. It's a simple thing which, I'm sure, we aren't the only one cooking, but it's a favorite of mine, and makes me feel like I'm cheating. See what it's all about here: Mushed-up egg half sandwich. Mushed up egg half sandwiches! Other than cooking, I've been walking quite a bit, and thinking. Now that all the partying and celebrating is done and that I had some time to myself, I finally had the time for some much needed sitting back and thinking things through. For over two years my energy has been all over the place, and I have been feeling for a while like I was hanging on my weight loss by a hair. It's time for a makeover! My first step was to realize that somewhere over the years, my focus had shifted and not for the better. I decided to put the focus back on setting significant goals, and achieving them, rather than focusing on the process itself. It's not about how many times I go to the gym, but rather about why am I wanting to workout? Why do I want to eat right? What am I working for? See how my whole reasoning went, and how refocusing can really help you prepare for success here: Not Resolutions, goals. You know what though? Goals aren't only helpful if they are worth the effort to you. It's also important to understand why you want to achieve them, and to know that you actually CAN achieve them. It's work, but it's worth it! I sort of worked it out for myself here: Here we are! It's 2012 my friends! Lets get this year started the right way with a goal, a plan, and a lot of want power! 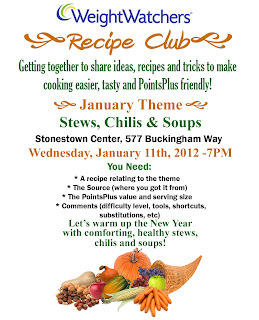 Remember that there is a meeting of the Recipe Club on January 11th at 7pm at the Stonestown center. 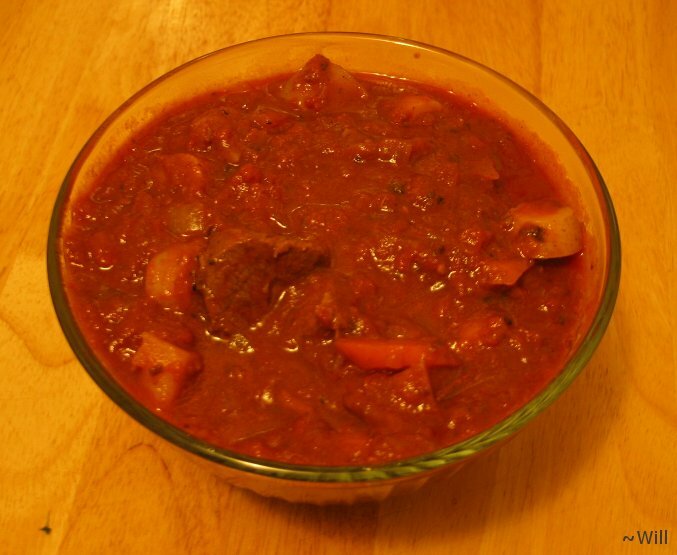 The theme for January is Soups, Stews, and Chilis. We are warming up for winter! Never be afraid to email me, I'm there for you! Starting on January 2nd, I will be back to my usual available self (we're running out of cartoons to watch, HA!). I will see you in the meeting room. Lets get this weight loss thing going and going strong! I hope the Holidays are treating you well and that you are getting ready to enter 2012 with a spring in your step. I know I am! 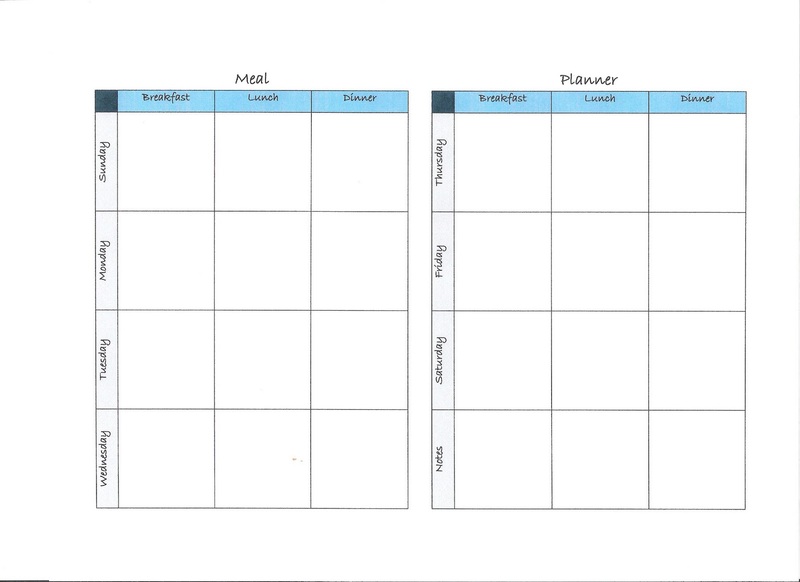 There has been a lot of changes to my schedule, and to my life. A lot of you now have a new leader, whom I KNOW is doing a great job because those who were chosen to replace me are just that great! The Melanie Weekly Blog is coming back! The Weekly itself will be simplified. I’m keeping my little “Topic of the week” section, because it’s fun to know what we’ll be talking about before you get there, right? I want to put in a “Member section” where I can report on how my 2 groups are doing, and maybe brag about people’s milestones? Wouldn’t that be cool? I will also have a little “Lifestyle” section where I will link to anything I posted that week on my Lifestyle blog and the attached Recipe blog. Those blogs are more related to my own journey on this healthy lifestyle of ours, and on what I learn and try out for myself. Hopefully that way I can still share and encourage you to try and have fun with this without having to put in extra research to “have something new” for the Weekly. Finally, I plan on keeping you posted on what’s going on at WW in the Bay Area but in a less formal manner than having an “Events” blog, or an “On sale” sections. I want to take a minute to thank you my members and my friends for being there week after week through 2011. This year has been great, this year has been difficult. We have seen success together, set backs, joy, sadness, inspiration and frustrations, and yet here we are, good and ready to get started all over again. I intend on taking the good, the smiles, the lessons, and the victories of 2011 and use them as fuel for my efforts during 2012. The new year is full of promises, of possibilities and opportunities. Take them, step ahead and grab whatever it is that you want for 2012! We are not making resolutions, we are setting goals, and already we can plan ahead and prepare for the steps that will lead us to those goals. We’re in this together, and as long as we stick together, not much can stop us! I wish you a wonderful year 2012, full of love, health, success, smiles, lessons and victories. I am proud and honored that you have chosen me as your leader and will be looking for you in the meeting room! Thank you again and Happy New Year!!! It’s been a while since I last posted on here. To make a long story short, I have a lot going on and needed to back off a little bit. The blog will live on, but I’m in the process of reorganizing and refocusing the whole thing, so I needed some thinking time. I couldn’t pass up Thanksgiving though. So I’ve put together a few things that I’m hoping will be helpful for you this week! Thanksgiving is first and foremost about giving thanks and I want to thank you my members, and my readers, for your strength, your dedication for this journey we are all on together. I want you to know that over the last 8 years, I have learned and grown as a person, as a Weight Watchers members, and as a leader from your experiences, your insights and you strength of character. You inspire me, motivate me, and remind me on regular basis that you can do anything if you really want to. You have also shown me that there are people out there who are good, caring and strong. Thank you! Add a little bit to your activity routine every day : It’s easier to earn an extra 2 AP+/day than try to earn 6 AP+ the morning of Thanksgiving. Remember you can swap your AP+ for Food P+ on the week that you earned it! Look up recipes: There are a lot of delicious healthy recipes floating around at this time of the year on the web. With a little research you can “healthy up” old favorites, or find new avenues to explore that can make the Thanksgiving dinner healthier and still memorable. Remember Etools and the message boards! Shop ahead: The 2-3 days before Thanksgiving, the grocery stores will be overloaded, and under stocked. It’s not too late to avoid most of the craziness. This close to T day, you might want to go shop early in the morning or a little later at night to avoid the crowds. You want to shop for cooking supplies, but also for safe snacks, to munch on while the appetizers are going around. 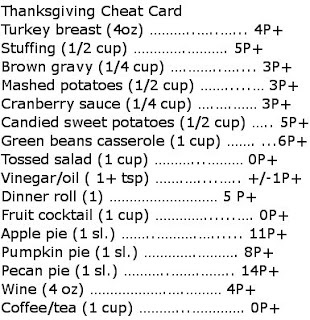 Set your Winning Outcome and then strategize: What is your personal Winning Outcome for the Thanksgiving dinner? You want to track everything and stick to your P+ budget? Is it going to be a Simply Filling day? Are you setting a strict goal? Or are you just trying not to pass out on the couch at the end of the night? Drink a lot of water to keep you hydrated (and busy). There are a lot of things you can do ahead of time to make sure that your Thanksgiving Day is stress free and fun. No matter how prepared we are, there is no denying the fact that once faced with a table overloaded with goodies, some of us might struggle with keeping things under control. When it comes to loading the plate, there is 2 main questions you must ask yourself: What am I going to eat? And How much of it am I going to eat. Which foods can I do without? 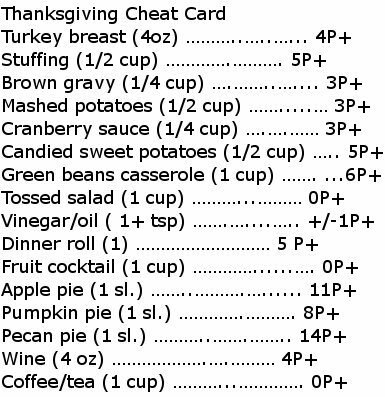 For example, I HATE cranberries, so not having that sauce, and mashed potatoes are just “ok” so that’s not worth the P+. Which foods can I have any time? There are foods on there that are year round food really: Mashed potatoes, unless it’s Granny’s special recipe that comes once a year, isn’t worth splurging on to me. Which foods are a must? Some of the Thanksgiving fare is just either too good to pass up, or so deeply tied to tradition that passing on them would just not go. Those are the foods you want to go for. Every year I have a slice of real, full fat/sugar/everything pumpkin pie. Not skipping that one because it’s worth every single P+. “Yummies” (sauces, dressings, etc) comes last taking whatever space is left. The food you put on your plate makes little islands, the food CAN”T TOUCH. This is automatic portion control, unless you’re an engineer, you can’t overload while doing this (and it’s fun!). The holidays can be a stressful and sometimes sad time for some of us. Having lost loved ones, or living far away from family members can make us feel cut out from all the festivities. Add all that with the overabundance of temptation, this can spell trouble. Take time to acknowledge the feelings that rise up at the time of the year and remember that food is not the solution. Reach out, talk to loved ones, help somebody, treat yourself with non food goodies, find a way to honor your feelings rather than trying to squash them. The format is a little off, but the information is there. Hope it helps! Thanksgiving is a great time of the year in which we celebrate those we love, and give thanks for the little and big things in our lives. Since traditionally, Thanksgiving is a celebration of abundance, the focus often is on the foods as well as (sometimes more than) on the thanks. Let’s put the focus back where it belongs this year, and put the focus on the love, the family, and the gratefulness of the season. Don’t worry, I’m not saying we want to skip the food! Just that, it should be “part of” the celebration, not the sole focus of it. How’s that sound? Thank you, from the bottom of my heart, for being part of my meetings. You bring inspiration, motivation and light to my life, and I’m hopeful that in some small measure, I can do the same to you. My husband and I (as well as Grace the dog, Leo and Gaya the cats) want to wish you all a Happy Thanksgiving! Halloween is almost there! The kids are all excited, most have picked their costumes and are getting ready to go trick or treating. Fun, fun, fun all around! To most of us though, Halloween means 1 thing: Candies everywhere. Every business we go to have a candy bowl, the stores are filled to the rafters with the "seasonal treats" (as if candies didn't exist the rest of the year! ), the kids come in from trick or treating with bags full of candies, we feel obliged to buy candies for the trick or treaters who will inevitably stop at our door. If you have the tiniest of a sweet tooth, it seems like you're suddenly dropped in the middle of a mine field! Now what? This week we will talk about ways to manage our sweet tooth during the Halloween celebration. You can enjoy Halloween without turning into a sugar monster! One thing that helps me when I know there will be temptation to avoid, is the Mini Bars! I always have at least one of those in my bag. They are delicious and only 2 PointsPlus. They can give me that sweet fix I need when temptation gets to be too strong. I posted these last year, and they were a hit, so I figured I would share them again this year! I did these for a party with adults only (I have no kids) and they were a hit! As George Bernard Shaw said: “We don't stop playing because we grow old; we grow old because we stop playing.” The Point value will vary depending on the brand/recipes you use and the serving size, but it’s a lot of fun to put together! Cook the brownie mix following the package directions, let cool enough to handle. Crumble the brownies in the large shallow bowl and mix in the worms. Add-on: You can use a handful of FiberOne cereal to throw in. They look like twigs making the “mud” look more realistic. Once the eggs are cooked, crack the shells by rolling the eggs between a hard surface and your hand being careful not to squish them. Do not remove the shells. Once the shells are good and cracked all over, put the eggs in a bowl of water to which you have added 20-25 drops of food coloring. Let soak 10-15 minutes. Remove the eggs and peel off the shells. The results should be eggs with a marble effect in green. A bowl of fruit punch (I like to mix pineapple, pomegranate and tangerine juice). 2+ cup of orange juice. Fill the glove with orange juice, tie the wrist securely and put in the freezer. Just before serving take the glove out of the freezer and peel off the orange juice “hand”. Put the hand in the punch bowl. It looks creepier as it melts! There are tons of ideas like that floating around on the web. Halloween is only one evening, do not let it be the beginning of "food season". There are candies around all year round, they are just decorated differently at this time of the year. Unfortunately, putting a witch or a ghost on a candy wrapper doesn't remove the carbs or the fat from the candy inside! Wouldn't that be neat? This time of the year is just like any time of the year, take the challenges one at a time, plan for them and then enjoy yourself. The views, opinions and content of all of my blogs are my own and in no way representative of the views and opinions of my employer. Please refrain from using any of the visual or intellectual content of any of my blogs without my written permission.Thank you. All intellectual and artistic content of this blog is mine and mine alone. 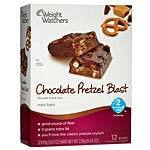 The ideas are my own and not necessarily reflect the position of Weight Watchers as an organization. Please do not use in part or as a whole the content of this blog without my written permission. Thank you!